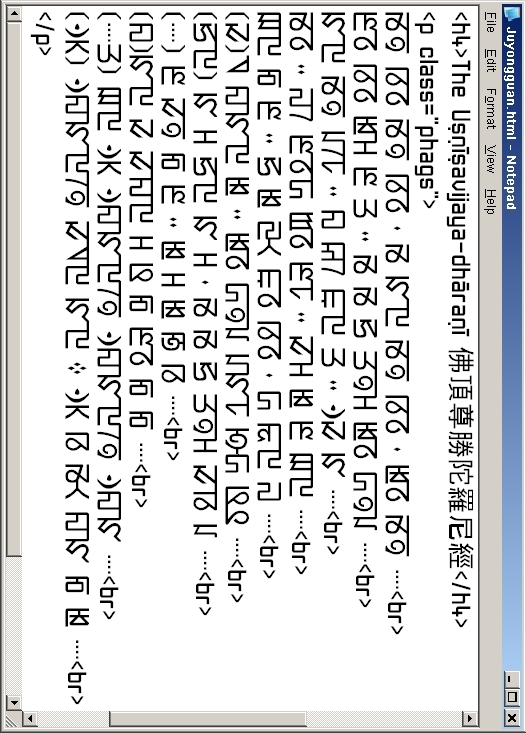 I have now released two Tibetan style Phags-pa fonts, unimaginatively named "BabelStone Phags-pa Tibetan A" and "BabelStone Phags-pa Tibetan B", which may be downloaded from here. 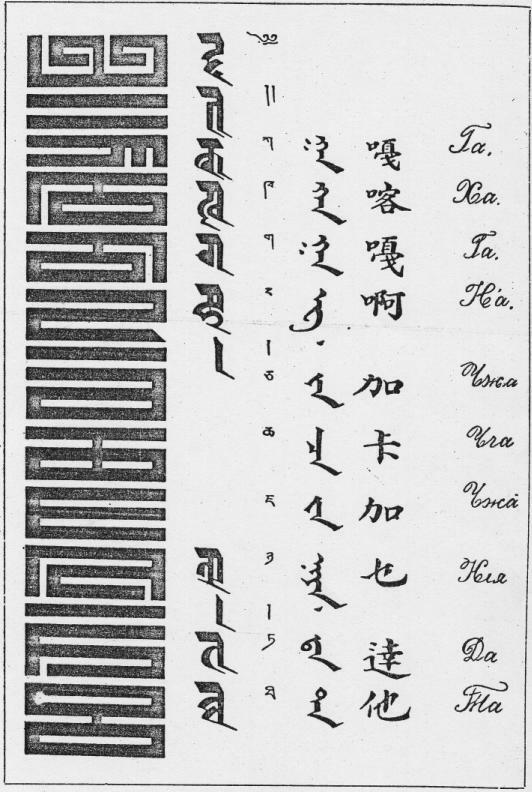 These fonts are both modelled on Phags-pa script primers such as the example below (with Lantsa, Tibetan, Mongolian, Chinese and Cyrillic) obtained by a Buriat Cossack officer, Tsokto Garmeyevich Badmazhapov, in 1903. The only difference between the two fonts is that the letters THA [U+A849], MA [U+A84F], TSHA [U+A851], DZA [U+A852], WA [U+A853], ZHA [U+A854], SHA [U+A85A] and Subjoined RA [U+A871] have slightly different letterforms. 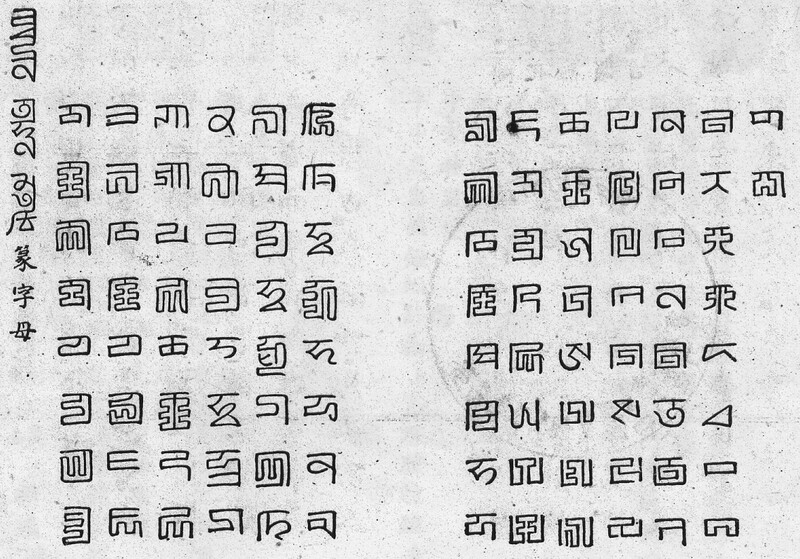 Source : Nicholas Poppe, The Mongolian Monuments in ḤP'AGS-PA Script (Otto Harrassowitz, 1957) page 16. The Tibetan style of Phags-pa script, known in Tibetan as hor-yig gsar-pa ཧོར་ཡིག་གསར་པ་ "New Mongolian letters" is a distinctive style of the Phags-pa script that is used to a limited extent in Tibet and Mongolia as a decorative script for engraving seals, inscribing book titles on the covers of traditional pecha books, and for architectural inscriptions such as those found on temple columns and doorways. However, the script is not used for writing texts. 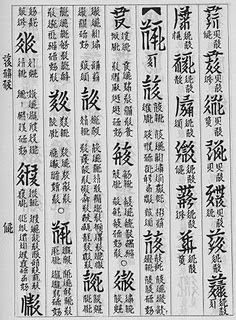 The Tibetan style of Phags-pa script is squarer and more compact than the original script used during the Yuan dynasty, but like its predecessor it is still written in vertical columns running from left to right. Some consider this to be a separate script, distinct from the Yuan dynasty Phags-pa script, but I do not subscribe to this point of view as the only significant difference between modern Tibetan Phags-pa script and Yuan dynasty Phags-pa script is the stylization of the letterforms. 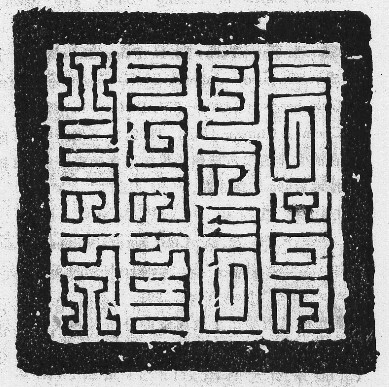 In fact, the same compact, square letterforms can already be seen in some Yuan dynasty inscriptions, such as this title inscription (碑額) on a monument dated 1289, where some letters are identical to Tibetan style Phags-pa letters, whilst other letters use more typical seal script forms. 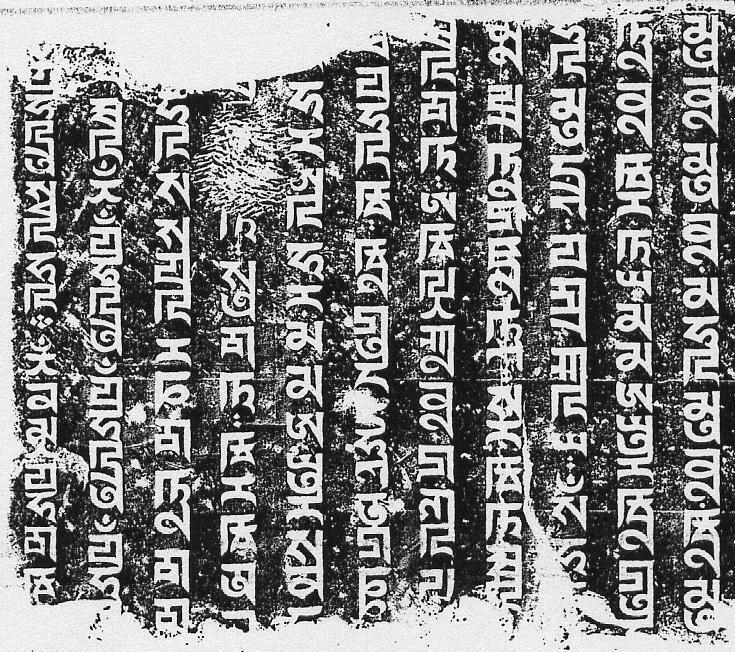 And for comparison, here is the same inscription as written in typical Tibetan style Phags-pa letters (BabelStone Phags-pa B). 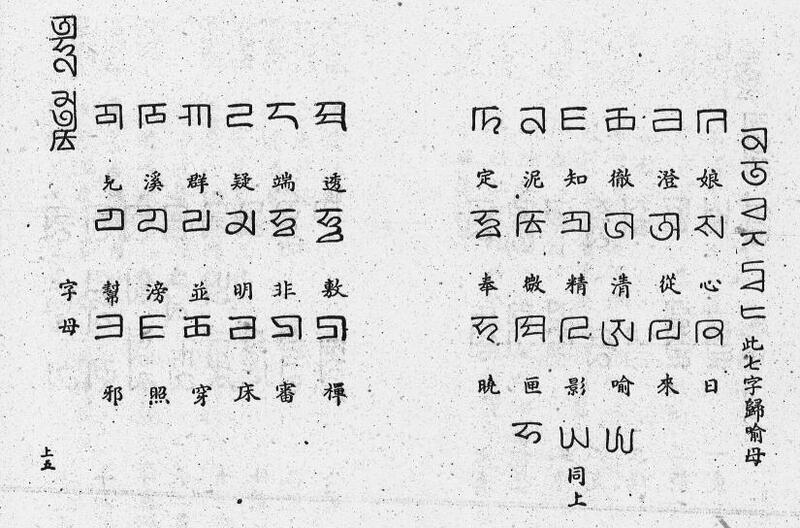 Notice in particular how the letters A and NA in the word 'wen (院) halfway down the second column are identical to the forms used in the 1289 inscription. 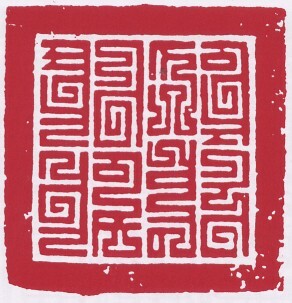 It is clear from this example that the Tibetan style of Phags-pa evolved from the seal script form of Phags-pa that was often used for the title inscriptions of monuments in the Yuan dynasty. However, it was not until two hundred years after the fall of the Yuan dynasty that the Tibetan style of Phags-pa achieved its modern form. 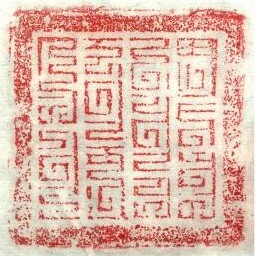 The earliest attested use of this style of Phags-pa script is on a golden seal that is recorded to have been given to the third Dalai Lama by Altan Khan (1507-1582) in 1578; although the original seal is now lost or destroyed, examples of imprints from seals with the same Phags-pa text are known from documents dating from 1648 and later. In 1982 a stone pillar was unearthed near Hohhot that has an inscription in Sanskrit and Mongolian, with a Phags-pa inscription on either side that records that the pillar was errected in 1580 by a grandson of Altan Khan. 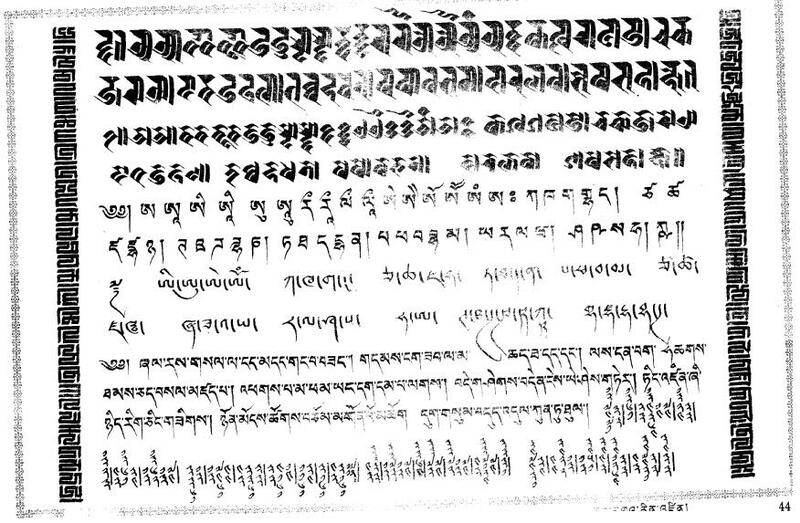 The style of lettering in this Phags-pa inscription is very similar to the Tibetan style Phags-pa script found in Tibetan seals and seal imprints. The close date of this stone pillar to the date of the seal of the third Dalai Lama suggests that the Tibetan style of the Phags-pa script achieved its distinctive form in Mongolia during the reign of Altan Khan (1543-1582). Finally, here are a couple of examples of contemporary Tibetan Phags-pa calligraphy, with thanks to Chris Fynn for the scans. Source : Bod-kyi Yi-ge'i gZugs Ris བོད་ཀྱི་ཡི་གེའི་གཟུགས་རིས (Lhasa: Tibet People's Publishing House, 1999) page 44. Source : Gangs-can mKhas-pa'i Phyag-bris sNa-tshogs Phyogs-bsdus Rin-chen Phreng-ba གངས་ཅན་མཁས་པའི་ཕྱག་བྲིས་སྣ་ཚོགས་ཕྱོགས་བསྡུས་རིན་ཆེན་ཕྲེང་བ (Lanzhou: Gansu People's Publishing House, 1990) p.170. 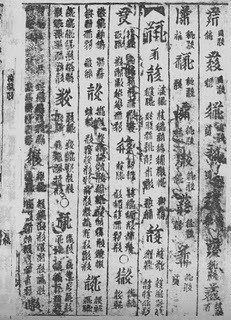 The Yuan dynasty rhyming dictionary Menggu Ziyun 蒙古字韻 is one of the most important Phags-pa texts, as it gives the pronunciation in Phags-pa script for over 9,000 Chinese characters. However, the author (or editor of the only extant 1308 edition) attempts the impossible task of reconciling the pronunciation of the proto-Mandarin Chinese spoken at the time with the traditional phonetic classification of Chinese into thirty-six initials that had been developed during the Tang and Song dynasties several hundered years earlier. 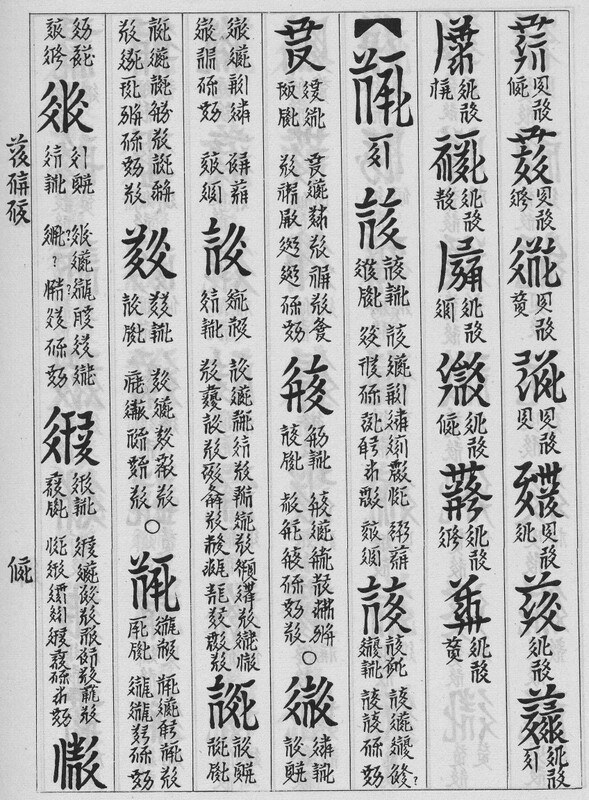 As there was no longer a one-to-one correspondence between the historic thirty-six initials and the contemporary pronunciation, Menggu Ziyun uses variant forms of some letters to represent the contemporary Yuan dynasty pronunciation and at the same time maintain the historic phonetic distinctions of the traditional "thirty-six letters". The situation is rather complicated, and I won't go into details here (read here if you are interersted), but I'll summarise the relationship between the historic thirty-six initials and Phags-pa letters in the table below. The phonetic values of Initials 17-19 had converged by the Yuan dynasty, and are distinguished in MGZY by two forms of the letter FA. It may be that the original text of MGZY used three forms of the letter FA, but textual corruption in the only extant version of the book (an 18th century manuscript copy of a copy of ... the original 1308 printed edition) has obliterated the distinction; or it may be that because all three initials never occur with the same final, there is never any need to distinguish between more than one particular pair of the three historic initials for any given syllable, so two forms of the letter FA are sufficient. The phonetic values of Initial 29 and Initial 30 had converged by the Yuan dynasty, and are distinguished in MGZY by two forms of the letter SHA. The phonetic values of Initial 31 and Initial 32 had partially converged by the Yuan dynasty, so that the Phags-pa letter HA is used for Initial 31, and also for Initial 32 before the semi-vowel /j/ and front vowels excluding /i/, but the Phags-pa letter XA is used for Initial 32 before back vowels and /i/ (i.e. occurences of HA and XA are mutually exclusive). The situation for Initial 33 and Initial 34 is complicated and not entirely clear. Both Phags-pa letter -A ("Small A") and the normal form of Phags-pa letter YA are used for Initial 33 (historic null initial); whereas as both Phags-pa letter 'A (the null consonant) and a variant form of Phags-pa letter YA with a trumpeted bowl are used for Initial 34 (historic palatal initial). In summary, MGZY uses two different forms of each of the letters YA, SHA, HA and FA to represent historic phonetic differences for some syllables that were phonetically identical in Yuan dynasty proto-Mandarin. These glyph differences are not normally seen in other Yuan dynasty Chinese texts and inscriptions in the Phags-pa script; that is to say, in most extant Chinese Phags-pa texts other than MGZY only a single form of the letters YA, SHA, HA and FA are found, regardless of the historic phonetic value of the word that it occurs in. Thus, the use of the four characters U+A86D ꡭ, U+A86E ꡮ, U+A86F ꡯ and U+A870 ꡰ should normally be restricted to contexts involving MGZY. 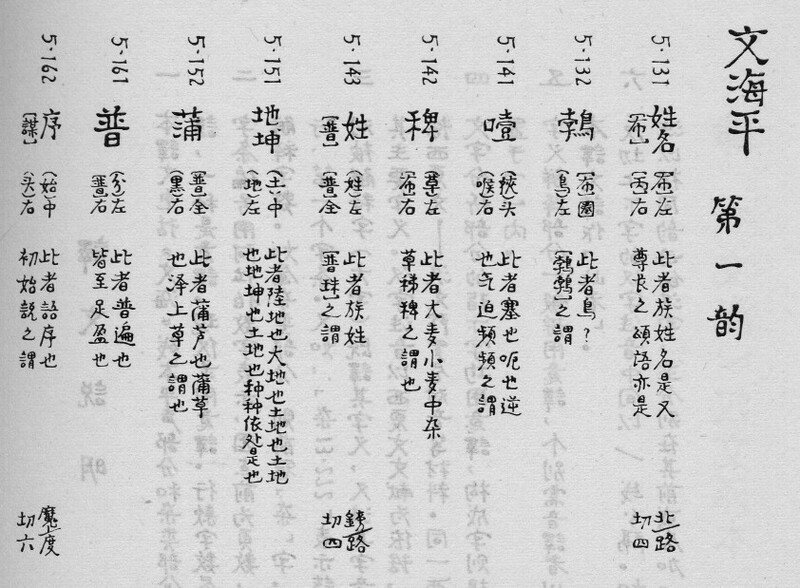 And for those of you interested in historical Chinese phonetics, one of my projects for the spring is to produce an electronic version of the complete text of Menggu Ziyun. Now that I have released my first Phags-pa font, I thought it would be useful to discuss Phags-pa shaping behaviour, as very few people are familiar with the script, and it is quite complex. Further information on the Phags-pa script, its encoding model and shaping behaviour can be found in Section 10.3 of The Unicode Standard version 5.0. First of all, here is a table of the encoded Phags-pa characters (note that you need to have BabelStone Phags-pa Book installed to see the Phags-pa characters; also note that with IE the characters should be oriented vertically, but with other browsers they may not be). Phags-pa characters form syllable units in which the letters comprising a syllable ligate together, and each syllable unit is separated from each other by white space. Letters normally ligate along a stem running down the right side, but mirrored letters used for Sanskrit ligate along the left side, and the vowel o joins down a central stem. Examples of words in different languages are given below. Note that layi is considered a single syllable as ayi is used to represent a final /ai/ diphthong in Mongolian and Sanskrit. The four vowels I, U, E and O have distinct positional forms, as shown in the table below. A mirrored series of the letters TA, THA, DA and NA are used in the Sanskrit Phags-pa inscriptions at Juyongguan 居庸關. These letters, which represent the Sanskrit retroflex letters ṭa, ṭha, ḍa and ṇa, are not found in any other extant Phags-pa text or inscription. For example, on the 1348 Dunhuang inscription Sanskrit maṇi is represented in Phags-pa script as MA NI ꡏ ꡋꡞ with no mirroring. Note that a mirrored letter SHA representing Sanskrit ṣha does not occur, and so the kṣh combination is written with the Phags-pa letters KA followed by unmirrored SHA in the Juyongguan inscriptions. After the letters TTA, TTHA, DDA or NNA (or the mirrored form of the letters Subjoined YA and HA) a following letter I, U or E is mirrored, although in some places in the Juyongguan inscriptions the letter I is not mirrored after the letter TTHA. After the letter NNA a following letter Subjoined YA is mirrored. After the letter DDA a following letter HA is mirrored. After the letters TTA or TTHA a following letter Small A may be mirrored, but in most instances in the Juyongguan inscriptions the Small A is not mirrored, presumably because a mirrored Small A is identical to the letter SHA. When mirrored letters are joined together they ligate along a lefthand stem rather than the righhand stem as is normally the case. If the letter TTHA is followed by an unmirrored Small A the ligature may be on the right or the left side. As the mirrored forms of the letters I, U, E, Small A, HA and Subjoined YA are contextual glyph variants they are not encoded as separate characters, but are automatically selected by the rendering system as appropriate. In practical terms this means that an OpenType Phags-pa font will have normal and mirrored forms of theses characters and apply a substitution rule to replace the normal form with the mirrored form after a mirrored form glyph. These rules are applied automatically by the rendering system so that the normal or mirrored form, as appropriate for the particular context, is displayed automatically without any need for user intervention. My Phags-pa fonts follow the agreed shaping behaviour for Phags-pa (see section 10.3 of The Unicode Standard version 5.0), which is to mirror the glyph for the letters Small A [U+A856], HA [U+A85C], I [U+A85E], U [U+A85F], E [U+A860] and Subjoined YA [U+A868] after the letters TTA [U+A869], TTHA [U+A86A], DDA [U+A86B] or NNA [U+A86C] or after another mirrored glyph. 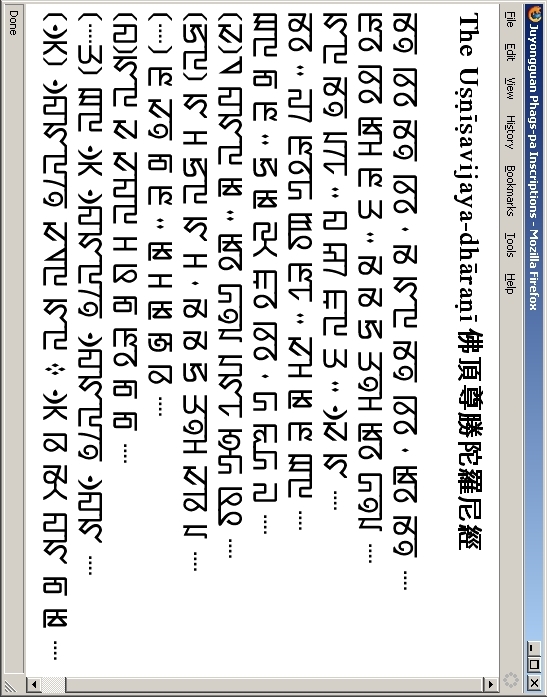 However, there are times when the user may wish to override the default mirroring behaviour, for example in order to display mirrored glyph forms in isolation or in order to represent those examples of unmirrored I after the letter TTHA or unmirrored Small A after the letters TTA and TTHA that occur in the Juyongguan inscriptions. This is acheived by means of variation selectors. For Phags-pa VS1 [U+FE00] is used to produce the opposite form of a reversing letter that would be expected from its context. This is an important distinction to note, as it differs from the behaviour of mathematical standardized variants, where a particular variation sequence always produces the same glyph. Thus for Phags-pa the sequence U, VS1 <U+A85F U+FE00> will produce an unmirrored letter U glyph if it occurs after one of the letters TTA, TTHA, DDA or NNA or after a mirrored glyphform of the letters I, U, E, Small A, HA or Subjoined YA, but will produce a mirrored letter U if the sequence occurs after any other Phags-pa letter or in isolation. 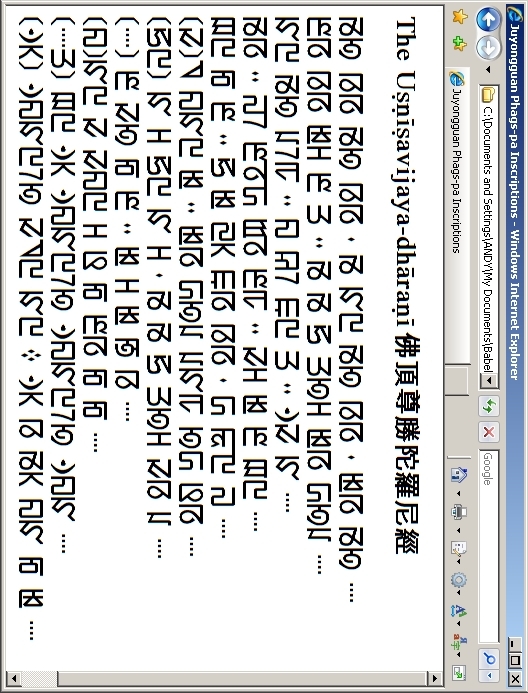 Some examples of Sanskrit words that have mirrored and unmirrored glyphs are shown below. To celebrate the recent encoding of the Phags-pa script in Unicode 5.0 I am releasing some free OpenType Unicode Phags-pa fonts that fully implement Phags-pa shaping behaviour (for which see Section 10.3 of The Unicode Standard version 5.0). These fonts work correctly under Windows XP and later, although I have had to set the script tag in the OT tables to <latn> rather than <phag> in order to trick Uniscribe into applying the font's OpenType features [insert long and bitter anti-Uniscribe rant here]. I'm afraid that I have no idea whether these fonts will work on platforms other than Windows. The first font that I am releasing is BabelStone Phags-pa Book, which is a general purpose Phags-pa font which emulates the simple lines of Phags-pa letters used in Yuan dynasty printed Phags-pa texts such as Menggu Ziyun 蒙古字韵 and Baijiaxing Mengguwen 百家姓蒙古文. The font may be downloaded from here. Finally, here is the actual Phags-pa text that I have been testing with, so you can see how your system copes with it (you must first install BabelStone Phags-pa Book). The text is laid out horizontally, with line 1 at the bottom, and so you should read it either by twisting your head anticlockwise 90 degrees or by turning your monitor clockwise 90 degrees (IE does support vertical layout, but other browsers, such as Firefox, do not, so for maximum browser compatibility I have used horizontal layout here). And if all this has whetted your appetite for writing Phags-pa yourself, I have created a Phags-pa keyboard layout that can be used on Windows 2000 and later, which can be downloaded from here. In the next installment I will discuss Phags-pa shaping behaviour in some more detail, and there will be some more Phags-pa fonts available for download in a few days time, so keep watching this space. Sharp-eyed readers will have noticed, as I only did this morning, that my statement that Internet Explorer does not apply the OpenType features of my Phags-pa font is not entirely true. If you look carefully at the screenshot of Internet Explorer you will notice that there are in fact two short sections of correctly shaping Phags-pa text -- ꡩꡖ︀ on line 7 and ꡌꡱ ꡈꡞꡚ ꡪꡞ︀ on line 8. At first glance these islands of shaping in a sea of unshaping would seem to be inexplicable, but when you look at the underlying character codes (<A869 A856 FE00> and <A84C A871 0020 A848 A85E A85A 0020 A86A A85E FE00> respectively) the reason becomes clear(ish) -- these sections of text both contain variation selectors (VS-1, which reverses the default mirroring behaviour of the preceding character), so evidently Internet Explorer is applying the font's OpenType features when and only when variation selectors are involved. My guess is that as InternetExplorer does not recognise the Phags-pa script, it treats Phags-pa (and other Unicode 5.0) characters as a non-complex script and outputs the characters directly without the help of Uniscribe, but when it encounters a variation selector, then it decides it does need to treat the run which includes the variation selector as a complex script, and outputs the run using Uniscribe. I've just been informed that Word 2003 does let you use BabelStone Phags-pa Book for Phags-pa text, and when I just retested with Word 2007 I also found that I had no problems using my fonts, although Word still does not apply the OpenType shaping unless variation selectors are involved (i.e. it has the same behaviour as Internet Explorer). I can't explain why I had problems with Word 2003 and 2007 on two different machines a few days ago, but no problems today -- I can only suppose it may have been some difference between the beta font I was testing with and the released font ... I think I had better just blame user error. Anyway, please do keep me informed of any success or failure you might have in using the font with different applications. As expected, Google Chrome does not render Phags-pa text correctly, and nor does IE8, so at present there is no browser that I am aware of that does unconditionally apply joining and shaping behaviour to Phags-pa text. Now when you quit Fuju [Fuzhou] and cross the River, you travel for five days south-east through a fine country, meeting with a constant succession of flourishing cities, towns, and villages, rich in every product. You travel by mountains and valleys and plains, and in some places by great forests in which are many of the trees which give Camphor. There is plenty of game on the road, both of bird and beast. The people are all traders and craftsmen, subjects of the Great Kaan, and under the government of Fuju. When you have accomplished those five days' journey you arrive at the very great and noble city of ZAYTON, which is also subject to Fuju. At this city you must know is the Haven of Zayton, frequented by all the ships of India, which bring thither spicery and all other kinds of costly wares. It is the port also that is frequented by all the merchants of Manzi [southern China], for hither is imported the most astonishing quantity of goods and of precious stones and pearls, and from this they are distributed all over Manzi. And I assure you that for one shipload of pepper that goes to Alexandria or elsewhere, destined for Christendom, there come a hundred such, aye and more too, to this haven of Zayton; for it is one of the two greatest havens in the world for commerce. Henry Yule and Henri Cordier (eds. ), The Book of Ser Marco Polo, the Venetian, Concerning the Kingdoms and Marvels of the East (London: John Murray, 1903) Vol. II (Book II Chapter LXXXII). Last year when I visited the ancient port city of Quanzhou 泉州 (Marco Polo's Zayton) on the East China coast (but now miles from the sea) I didn't yet have a blog, so for my slightly belated first anniversary blog post I thought I would discuss some of the pictures I took at the Quanzhou Museum of Maritime History (海外交通史博物館). The museum has a marvellous collection of stone monuments dating from the Yuan dynasty (1279-1368), with inscriptions in a wide range of scripts and languages, reflecting the cosmopolitan nature of the city in the 13th and 14th centuries, but I was particularly interested in its unique collection of Christian tombstones with inscriptions in the Phags-pa script. Christianity was first introduced into China from Central Asia during the early years of the Tang dynasty (618-907), as part of a widepread missionary movement by the Assyrian Church, the members of which are widely but inaccurately referred to as Nestorian Christians. Christianity in China was supressed in the mid ninth century, but underwent a revival under the Khitan and Mongol regimes from the 12th to the 14th centuries, and during the Yuan dynasty (1271-1368) the "Nestorian" church had a strong presence amongst the Uighur population in the western fringes of China. It was also during the Yuan dynasty that the Catholic church first reached China. A series of Franciscan missions had been sent out by the papacy to Persia, India and China from the year 1241, but the first mission to actually reach China was that of John of Montecorvino (1246-1328), who had set out in 1289, and arrived at the capital of the Mongol Empire, known to Europeans of the time as Cambaluc (literally "City of the Khan", which is modern Beijing) in 1294. He built two churches in the capital, and is reputed to have translated the New Testament and Psalms into Chinese, but these translations no longer exist. In 1307 Pope Clement V sent seven Franciscan friars, each with the rank of bishop, to China in order to consecrate John as Archbishop of China. Only three of the seven, Gerard, Peregrine (Peregrinus de Castello) and Andrew of Perugia (Andreas Perusinus), survived the long journey, arriving in Cambaluc in 1308. Although John had established a strong presence in the capital, there were no missionary outposts elsewhere in China until Friar Gerard was sent to Zayton (Quanzhou) as bishop of the city. It seems that Zayton was chosen as the only bishopric outside the capital as it already had a Christian presence there in the form of a church that had been founded by a "rich Armenian lady". This church was established as a cathedral, and Gerard became the first bishop of Zayton. The fact that the existing church was converted into the Catholic cathedral would suggest that it may have been a Catholic church, and that at least some of the existing Christians of Zayton may have been Catholics associated with maritime trade rather than all Nestorians from Central Asia, who the Franciscans regarded as heretics. 30. Concerning the noble city called Zayton ; and how the folk thereof regale their gods. Departing from that district, and passing through many cities and towns, I came to a certain noble city which is called Zayton, where we friars minor have two houses ; and there I deposited the bones of our friars who suffered martyrdom for the faith of Jesus Christ. In this city is great plenty of all things that are needful for human subsistence. For example you can get three pounds and eight ounces of sugar for less than half a groat. The city is twice as great as Bologna, and in it are many monasteries of devotees, idol worshippers every man of them. In one of those monasteries which I visited there were three thousand monks and eleven thousand idols. And one of those idols, which seemed to be smaller than the rest was as big as St. Christopher might be. I went thither at the hour fixed for feeding their idols, that I might witness it ; and the fashion thereof is this : All the dishes which they offer to be eaten are piping hot so that the smoke riseth up in the face of the idols, and this they consider to be the idols' refection. But all else they keep for themselves and gobble up. And after such fashion as this they reckon that they feed their gods well. The place is one of the best in the world, and that as regards its provision for the body of man. Many other things indeed might be related of this place, but I will not write more about them at present. Henry Yule (trans. and ed. ), Cathay and the Way Thither; being a collection of Medieval Notices of China (London: The Hakluyt Society, MDCCCLXVI) Vol. I pp.381-383. 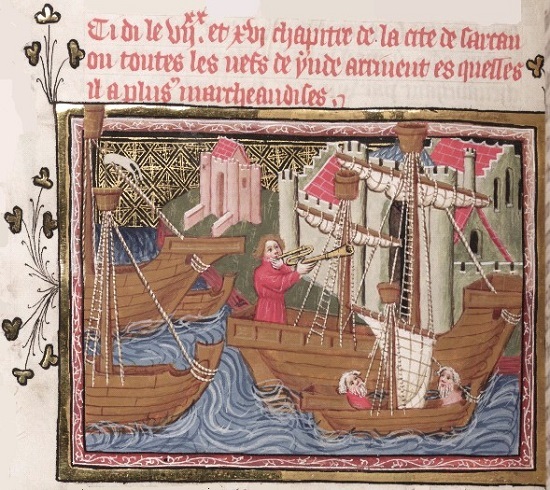 There is Zayton also, a wondrous fine seaport and a city of incredible size, where our Minor Friars have three very fine churches, passing rich and elegant ; and they have a bath also and a fondaco [a factory, i.e. "a mercantile establishment and lodging house in a foreign country"] which serves as a depôt for all the merchants. They have also some fine bells of the best quality, two of which were made to my order, and set up with all due form in the very middle of the Saracen community. One of these we ordered to be called Johannina, and the other Antonina. Henry Yule (trans. and ed. ), Cathay and the Way Thither; being a collection of Medieval Notices of China (London: The Hakluyt Society, MDCCCLXVI) Vol.II pp.115-116. One of the last bishops of Zayton may have been a certain Friar James of Florence, who was martyred in the "Empire of the Medes" (i.e. the Empire of Chaghatai) in 1362, and is recorded to have been "Archbishop of Zaiton". After the fall of the Mongol empire in 1368, the Catholic missions in China disappeared, and there was no further Catholic presence in China until the Dominican friar Gaspar da Cruz arrived in China in 1555. Friar Andrew of Perugia, of the Order of Minor Friars, by Divine permission called to be Bishop, to the reverend father the Friar Warden of the Convent of Perugia, health and peace in the Lord for ever ! .... On account of the immense distance by land and sea interposed between us, I can scarcely hope that a letter from me to you can come to hand. .... You have heard then how along with Friar Peregrine, my brother bishop of blessed memory, and the sole companion of my pilgrimage, through much fatigue and sickness and want, through sundry grievous sufferings and perils by land and sea, plundered even of our habits and tunics, we got at last by God's grace to the city of Cambaliech [modern Beijing], which is the seat of the Emperor the Great Chan, in the year of our Lord's incarnation 1308, as well as I can reckon. There, after the Archbishop [John of Montecorvino] was consecrated, according to the orders given us by the Apostolic See [Pope Clement V], we continued to abide for nearly five years ; during which time we obtained an Alafa from the emperor for our food and clothing. An alafa is an allowance for expenses which the emperor grants to the envoys of princes, to orators, warriors, different kinds of artists, jongleurs, paupers, and all sorts of people of all sorts of conditions. And the sum total of these allowances surpasses the revenue and expenditure of several of the kings of the Latin countries. There is a great city on the shores of the Ocean Sea, which is called in the Persian tongue Zayton [properly known as Quanzhou in Chinese]; and in this city a rich Armenian lady did build a large and fine enough church, which was erected into a cathedral by the Archbishop himself of his own free-will. The lady assigned it, with a competent endowment which she provided during her life and secured by will at her death, to Friar Gerard the Bishop, and the friars who were with him, and he became accordingly the first occupant of the cathedral. After he was dead however and buried therein, the Archbishop wished to make me his successor in the church. But as I did not consent to accept the position he bestowed it upon Friar and Bishop Peregrine before mentioned. The latter, as soon as he found an opportunity, proceeded thither, and after he had governed the church for a few years, in the year of the Lord 1322, the day after the octave of St. Peter and St. Paul, he breathed his last. Nearly four years before his decease, finding myself for certain reasons uncomfortable at Cambaliech, I obtained permission that the before mentioned alafa or imperial charity should be allowed me at the said city of Zayton, which is about three weeks journey distant from Cambaliech. This concession I obtained as I have said, at my earnest request, and setting out with eight horsemen allowed me by the emperor, I proceeded on my journey, being everywhere received with great honour. On my arrival (the aforesaid Friar Peregrine being still alive) I caused a convenient and handsome church to be built in a certain grove, quarter of a mile outside the city, with all the offices sufficient for twenty-two friars, and with four apartments such that any one of them is good enough for a church dignitary of any rank. In this place I continue to dwell, living upon the imperial dole before-mentioned, the value of which, according to the estimate of the Genoese merchants, amounts in the year to 100 golden florins or thereabouts. Of this allowance I have spent the greatest part in the construction of the church ; and I know none among all the convents of our province to be compared to it in elegance and all other amenities. And so not long after the death of Friar Peregrine I received a decree from the archbishop appointing me to the aforesaid cathedral church, and to this appointment I now assented for good reasons. So I abide now sometimes in the house or church in the city, and sometimes in my convent outside, as it suits me. And my health is good, and as far as one can look forward at my time of life, I may yet labour in this field for some years to come : but my hair is grey, which is owing to constitutional infirmities as well as to age. 'Tis a fact that in this vast empire there are people of every nation under heaven, and of every sect, and all and sundry are allowed to live freely according to their creed. For they hold this opinion, or rather this erroneous view, that everyone can find salvation in his own religion. Howbeit we are at liberty to preach without let or hindrance. Of the Jews and Saracens there are indeed no converts, but many of the idolaters are baptised ; though in sooth many of the baptised walk not rightly in the path of Christianity. Four of our brethren have suffered martyrdom in India, at the hands of the Saracens ; and one of them was twice cast into a great blazing fire, but came out unhurt. And yet in spite of so stupendous a miracle not one of the Saracens was converted from his misbelief ! All these things I have briefly jotted down for your information, reverend father, and that through you they may be communicated to others. I do not write to my spiritual brethren or private friends, because I know not which of them are alive, and which departed, so I beg them to have me excused. But I send my salutation to all, and desire to be remembered to all as cordially as possible, and I pray you, father Warden, to commend me to the Minister and Custos of Perugia, and to all the other brethren. All the suffragan bishops appointed to Cambaliech and elsewhere by our lord Pope Clement have departed in peace to the Lord, and I alone remain. Friar Nicholas of Banthera, Friar Andrutius of Assisi, and another bishop [Ulrich Sayfusstorf], died on their first arrival in Lower India, in a most cruelly fatal country, where many others also have died and been buried. Farewell in the Lord, father, now and ever. Dated at Zayton, A.D. 1326, in the month of January. Henry Yule (trans. and ed. ), Cathay and the Way Thither; being a collection of Medieval Notices of China (London: The Hakluyt Society, MDCCCLXVI) Vol.1 pp.496-499. Beyond the first word (hic) I find it difficult to match Fordyce's reading to the actual inscription, and in particular I do not see the words "Andreas Perusinus", so I have severe doubts about the validity of the accepted reading or whether it is indeed a memorial Bishop Andrew. 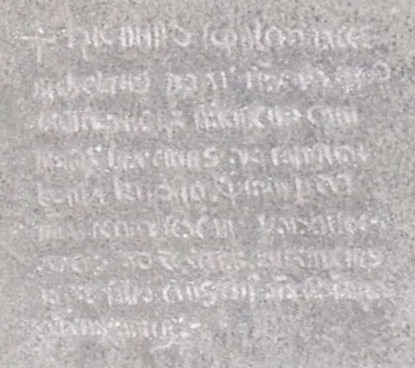 I hope that perhaps some of my readers may be able to give me their suggested readings of the inscription (or parts of it or even single words). is that the inscription is not in Syriac script. But whether or not this is actually the tombstone of Bishop Andrew, it is still an extremely important artefact, as the only certain archaeological evidence of the 14th century Franciscan mission to Zayton. For me the most interesting feature of this tombstone is the decoration above the Latin inscription. Although badly worn the carving clearly depicts two angels supporting a lotus flower upon which appears to be a seated figure wearing a bishop's mitre, confirming that the inscription is for one of the bishops of Zayton. 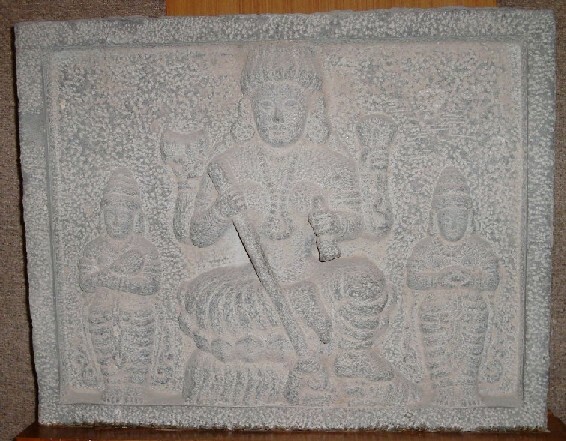 What is significant is that the image of two angels supporting a lotus flower is a common feature of tombstones attributed to Nestorian burials (see for example the two uninscribed headstones shown in the Christian Angels on the South China Coast exhibition, The Stones of Zayton Speak fig.33, and the tombstone dated 1311 shown below), and they have therefore been seen as emblematic symbols of the Assyrian church in China. Yet here they are on the tombstone of a bishop of an order which regarded the Nestorians as heretics. I suspect that the answer is simply that angels supporting a lotus flower is what the craftsmen employed to carve the tombstone were used to carving, so when commissioned to carve a tombstone for Bishop Andrew they naturally carved him seated on a lotus flower supported by two angels. 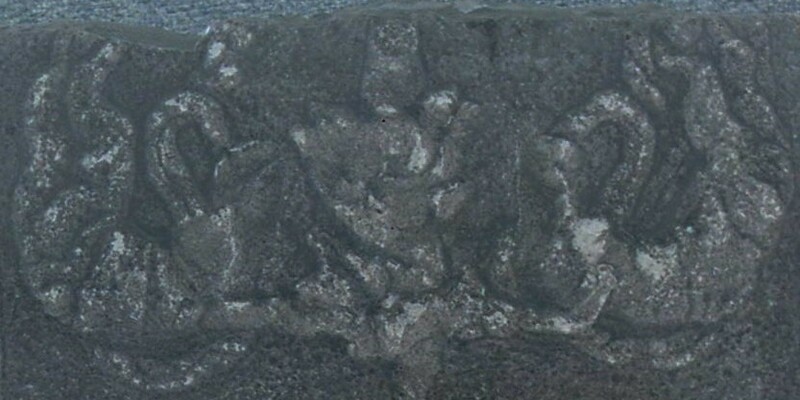 But what this means is that the image of two angels supporting a lotus flower cannot necessarily be taken to be conclusive proof that the person commemorated on the tombstone actually belonged to the Assyrian church. 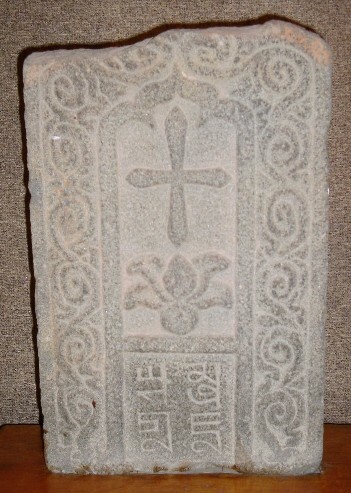 Most of the inscribed Christian tombstones from Quanzhou have inscriptions written in the Uighur language using the Syriac script, and are without doubt memorials to members of the Assyrian church who originally came from the western parts of the empire. 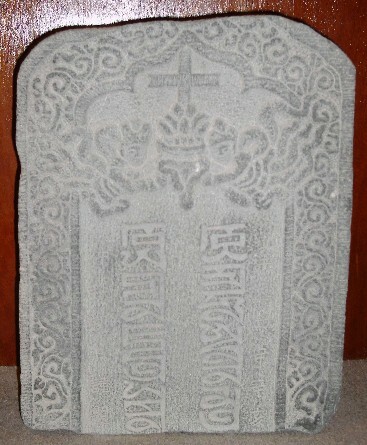 Many similar tombstones with Syriac inscriptions have also been found in the west of China and elsewhere in central Asia, especiially Kyrgyzstan. However the four tombstones shown below differ from the typical Uighur/Syriac examples in that their inscriptions are in the Chinese language (spelled phonetically using the Phags-pa script), and the names of the deceased are ordinary Chinese names, and so they would seem to be memorials to Han Chinese Christian converts rather than to Uighurs from central Asia. It has always been assumed that all the Christian tombstones of Quanzhou are relics of the "Nestorian" (i.e. Assyrian) church, but as I have suggested above, the supposed Nestorian symbols on the tombstones below may not necessarily be indicative of a Nestorian burial, as they are also found on the tombstone of the Franciscan Bishop Andrew (cf. especially the decoration on the 1311 Phags-pa tombstone below with the decorative carving on the tombstone of Bishop Andrew). The tombstones with Phags-pa inscriptions are dated 1311, 1314 and 1324, which makes them exactly contemporary with mission in Zayton of Bishops Gerard, Peregrine and Andrew (c.1308-1332). Without any knowledge of their archaeological context (because I stupidly managed not to buy the newly revised and expanded treatise on Quanzhou religious carvings by Wu Wenliang that had just been published the previous year) it is difficult to make any judgement, but I do wonder if it is possible that these particular tombstones were actually associated with the Franciscan bishopric of Zayton rather than the Assyrian church. 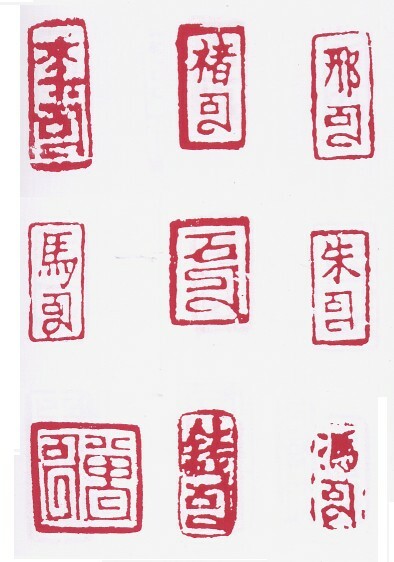 The use of Phags-pa script for writing Chinese is especially suggestive to me, as although the script was used to write Mongolian and Chinese in official documents and on monumental inscriptions of imperial edicts, as well as on coins, banknotes and seals, it was rarely used for non-governmental purposes, and I do not know of any other examples of tombstones, for any religion, that have inscriptions in the Phags-pa script. Giving the names of deceased in Phags-pa script is especially problematic as it is often not possible to be certain which particular Chinese character a Phags-pa syllable is intended to represent, especially as the Phags-pa script does not indicate tone, and so my transcriptions of the Phags-pa inscriptions into Chinese characters is in places only tentative (and sometimes differs from the transcriptions given in other studies of the tombstones). Ironically, the date, which could be written unambiguously in the Phags-pa script, is always written using Chinese characters. The question has to be asked, given that the Phags-pa script cannot distinguish between ideographic homophones and the tombs are for Han Chinese with ideographic names, why then is the main inscription written in the Phags-pa script ? 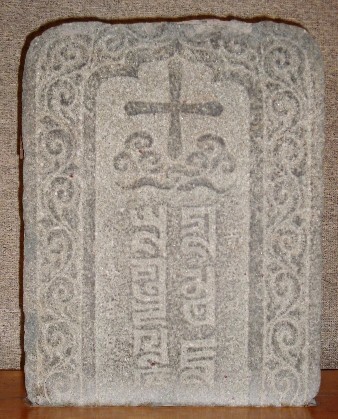 It may well have been that the Franciscan missionaries promoted the use of the phonetic Phags-pa script over the native ideographic script as it was easier for them to read and write Chinese with it, and if these were the tombstones of converts to the Franciscan church at Quanzhou then that would explain why their inscriptions are in the Phags-pa script. It is also interesting to note that the inscriptions themselves have no Christian content, but use exactly the same forms of wording that are found on ordinary non-Christian Chinese tombstones of the time. The cross and angels are the only indications that these are in fact Christian monuments. This contrasts with the Christian tombstones in the Syriac script which do include overt Christian text (see for example The Stones of Zayton Speak figs.16 and 18 which both start with the words "In the name of the Father, the Son, and the Holy Spirit..." in Uighur). 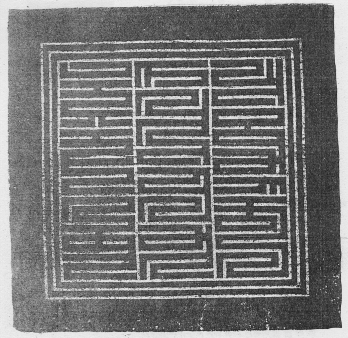 The main inscription reads ꡁꡗ ꡚꡋ ꡆꡦꡟ ꡗꡠꡋ ꡁꡡ ꡒꡜꡞ ꡝꡧꡞꡋ ꡏꡟ khay shan jėu yen kho dzhi 'win mu in Phags-pa script, representing Chinese kai shan zhu yan ke zi yun mu 開山朱延可子雲墓 "tomb of Zhu Yanke [styled] Ziyun of Kaishan". An inscription in Chinese on either side reads 至大四年辛亥，仲秋朔日謹題 "In the cyclical year xinhai [year of the golden pig] in the fourth year of the Zhida period, respectfully inscribed on the first day of the second autumn month". Zhida 4 corresponds to the year 1311. 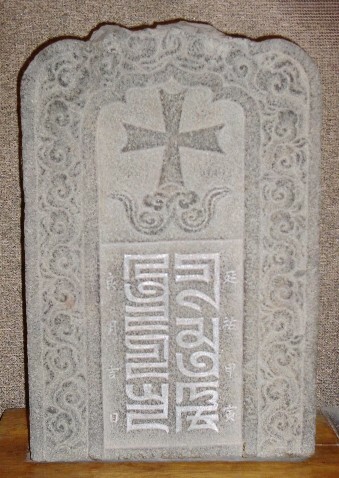 The Phags-pa text of this tombstone has also been interpreted as "開山朱延可訾雲墓". 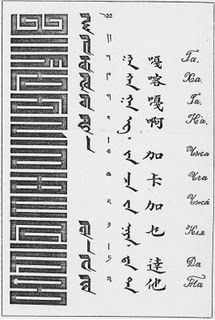 The main inscription reads ꡖꡟꡃ ꡚꡦ ꡗꡃ ꡚꡞ ꡏꡟ ꡈꡓ -ung shė yang shi mu taw in Phags-pa script, representing Chinese weng she yang shi mu dao 翁舍楊氏墓道 "tomb memorial of Yang Wengshe". An inscription in Chinese on either side reads 延祐甲寅，良月吉日 "In the cyclical year jiayin [year of the wooden tiger] of the Yanyou period, on a good month and an auspicious day". The cyclical year jiayin is the first year of the Yanyou period, corresponding to the year 1314. The Phags-pa text of this tombstone has also been interpreted as "翁葉楊石墓道". 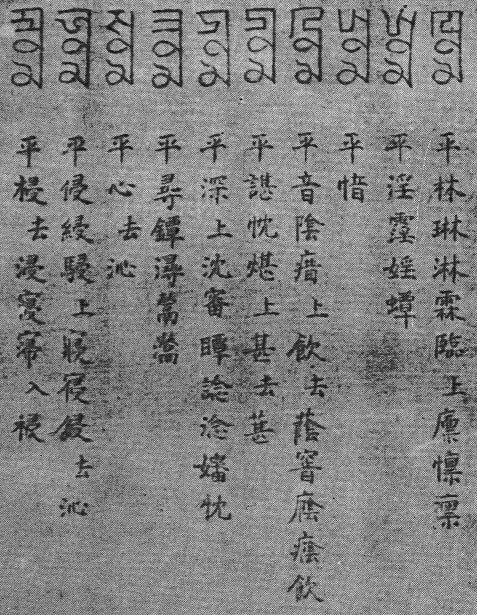 The main inscription reads ꡗꡞ ꡂꡟꡃ ꡙꡞꡓ ꡚꡞ ꡏꡟ ꡆꡞ yi gung liw shi mu ji in Phags-pa script, representing Chinese yi gong liu shi mu zhi 易公(劉/柳)氏墓誌 "tomb memorial of Liu Yigong" (the family name may be either Liú 劉 or Liǔ 柳, as Phags-pa script does not indicate tone). A faint inscription in Chinese on either side reads 旹歲甲子，仲春吉日 "In the cyclical year jiazi [year of the wooden rat], on an auspicious day of the second spring month". The cyclical year jiazi can only refer to the first year of the Taiding 泰定 period, corresponding to the year 1324. The Phags-pa text of this tombstone has also been interpreted as "易公柳濟墓址" or "易公劉石墓誌". 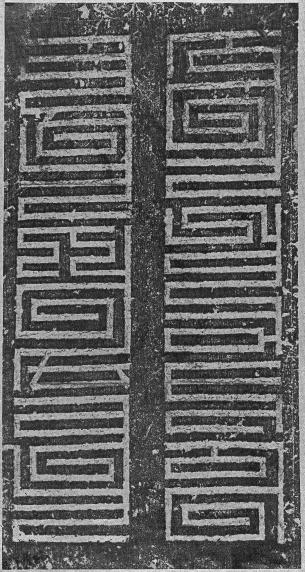 The inscription reads ꡗꡠ ꡚꡞ ꡏꡟ ꡆꡞ ye shi mu ji in Phags-pa script, representing Chinese ye shi mu zhi 葉氏墓誌 "tomb memorial of Mr. or Mrs. Ye". This is the only Phags-pa tombstone inscription that does not also give a date in Chinese script. 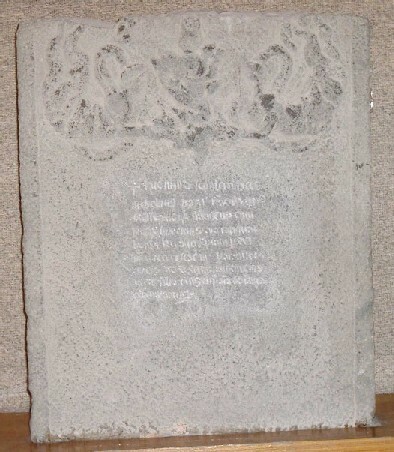 The Phags-pa text of this tombstone has also been interpreted as "葉氏墓址" or "葉石墓誌". Appendix : Note on the name "Zayton"
Quanzhou was known to European travellers to China as Zayton (in various spellings), from the Arabic name for the city, Zaitún, meaning an olive tree. However the Arabic Zaitún is in fact a corruption of the Chinese name for the coral tree (Erythrina variegata), citong 刺桐 "prickly tong". Because Quanzhou was famed for its coral trees, since the Tang dynasty (618-907) it had been known informally as the "city of coral trees" (citong cheng 刺桐城), and this literary epithet was later adopted as Zaitún "olive tree" by Arab traders. For centuries after Marco Polo's account of the splendours of Zayton were first made known to Europe, no-one knew exactly where Zayton was, and some even thought that it was a spurious, made-up name. It was only at the end of the 19th century that Zayton was conclusively identified as Quanzhou. The first city that I reached after crossing the sea was ZAITÚN. ... It is a great city, superb indeed; and in it they make damasks of velvet as well as those of satin, which are called from the name of the city Zatúníah ; they are superior to the stuffs of Khansá [Hangzhou] and Khárbálik [modern Beijing]. The harbour of Zaitún is one of the greatest in the world -- I am wrong; it is the greatest! I have seen there about an hundred first-class junks together ; as for small ones, they were past counting. The harbour is formed by an estuary which runs inland from the sea until it joins the Great River. Wu Wenliang 吳文良, Quanzhou Zongjiao Shike 泉州宗教石刻. Beijing: Kexue Chubanshe, 1957 (1st ed.) and 2005 (2nd ed., revised by his son, Wu Youxiong). Zheng Zhenman 鄭振滿 and Ding Hesheng 丁荷生, Fujian Zongjiao Beiming Huibian : Quanzhoufu fence 福建宗教碑銘彙編 : 泉州府分册 (3 vols.). Fuzhou: Fujian Renming Chubanshe, 2003. Junast 照那斯圖, "Yuandai Jingjiaotu mubei basibazi kaoshi" 元代景教徒墓碑八思巴字考釋. In Haijiaoshi Yanjiu 海交史研究 1994.2. Niu Ruji 牛汝極, "Quanzhou chutu Huihuwen Yelikewenjiao (Jingjiao) mubei yanjiu" 泉州出土回鶻文也里可溫教(景教)墓碑研究. In Xueshu Jilin 學術集林 vol.5 (Shanghai Yuandong Chubanshe, 1995). 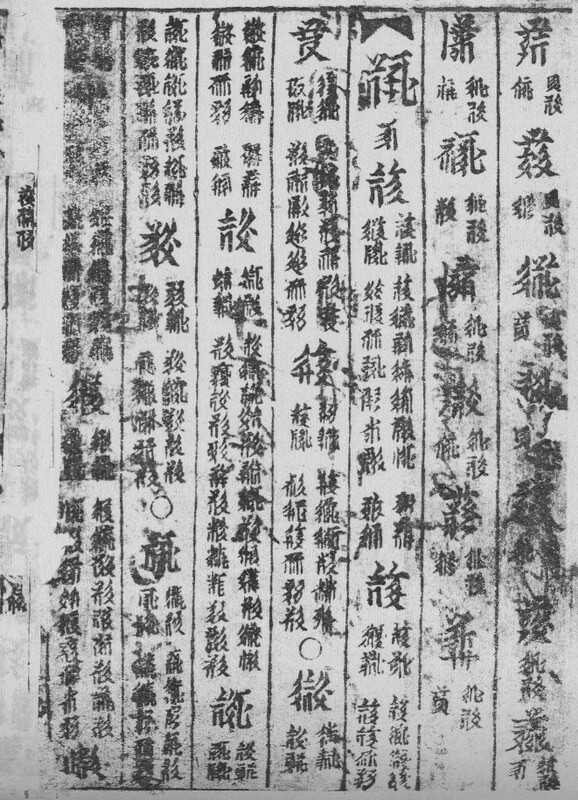 Niu Ruji 牛汝極, "Cong chutu beiming kan Quanzhou he yangzhou de Jingjiao laiyuan" 從出土碑銘看泉州和揚州的景教來源. In Shijie Zongjiao Yanjiu 世界宗教研究 2003.2. Pearson, Richard, Li Min and Li Guo, "Quanzhou Archaeology: A Brief Review". In International Journal of Historical Archaeology 6:1 (2002). Schottenhammer, A., ed., The Emporium of the World: Maritime Quanzhou, 1000–1400. Leiden: Brill, 2001.